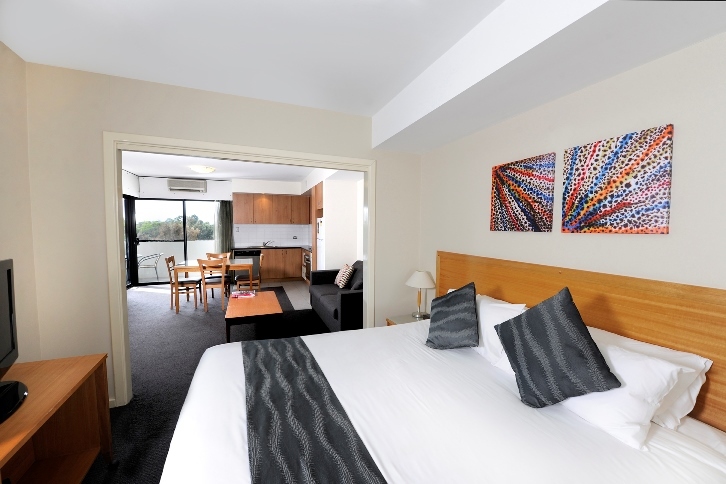 Assured Ascot Quays Apartment Hotel offers 68 modern and spacious apartments, all with full kitchens, laundry facilities and balconies overlooking either the Swan River or lush parklands. Apartment types to choose from include Studio, One, Two and Three Bedroom Apartments, Riverside One Bedroom Villa and Two Bedroom Townhouse, Suite and a Premium Suite. The Studio, One, Two and Three Bedroom Apartments are located in the main apartment complex. The Riverside Villas and Townhouses are located alongside the swimming pool and enjoy full pool and river views. 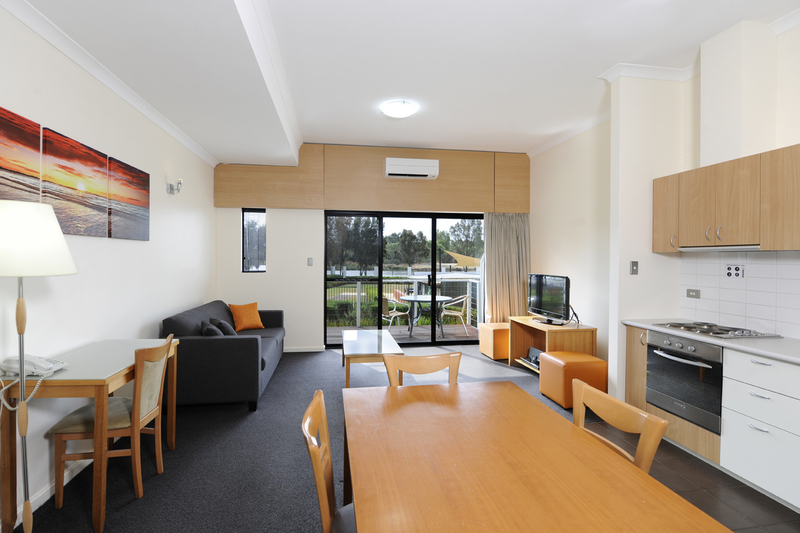 The unique setting and the range of apartment types has made it a favourite for families, corporate and long stay guests looking for riverside accommodation near Perth airport and in close proximity to the new Optus Stadium. The apartments are innovative, spacious and well designed with many thoughtful choices for guests such as gourmet kitchens with dishwashers, full size fridge, balconies, spas and great views. Other distinguishing features include reception open from 6am to 12.30am, complimentary parking, 25m swimming pool, gymnasium, business services, broadband wireless internet access and a tour desk. Continental breakfast buffet is available each day on the ground floor. The pantry shop in the lobby provides a range of heat and eat meals, fresh salads, pastries and snacks as well as alcoholic and non-alcoholic beverages. 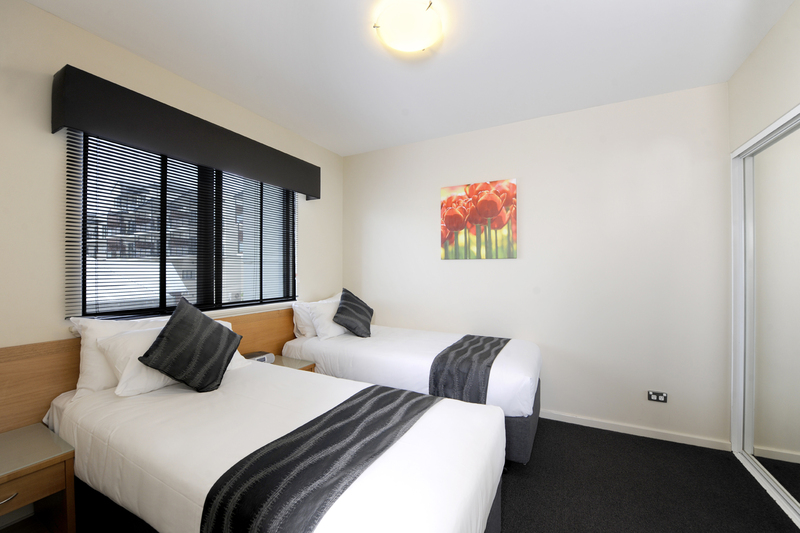 Our modern, fully serviced studio apartments have a balcony, spacious living area, full kitchen and laundry facilities. Rather than feeling cooped up in a small hotel room, enjoy the freedom and space that comes from having your own home-away-from-home for the duration of your stay. Whether you�re looking to experience as much of the city as possible while on holiday or need a comfortable and convenient place to base yourself during a work trip, our beautifully appointed studio apartments have the flexibility to deliver what you�re looking for. All apartments also have access to complimentary onsite parking, the gym, outdoor swimming pool and onsite restaurant. 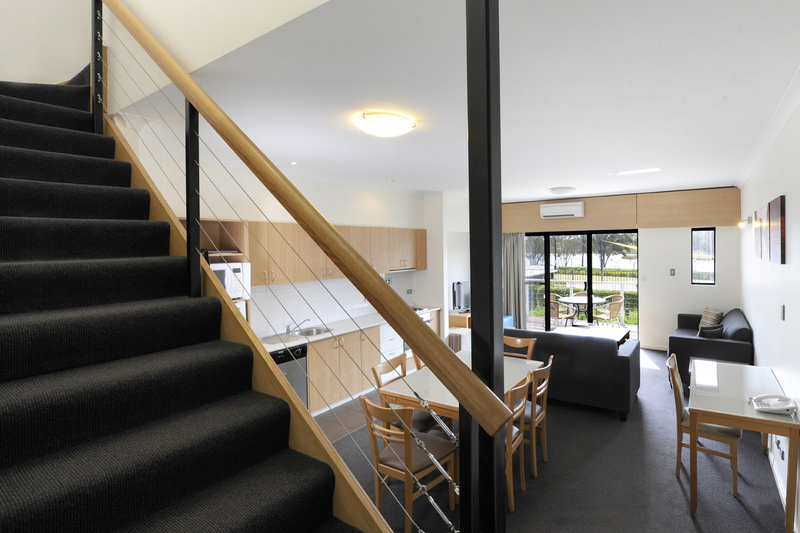 One Bedroom Apartments offer spacious living areas with full kitchen, laundry facilities and private balcony or patio. Disabled access apartments are available. 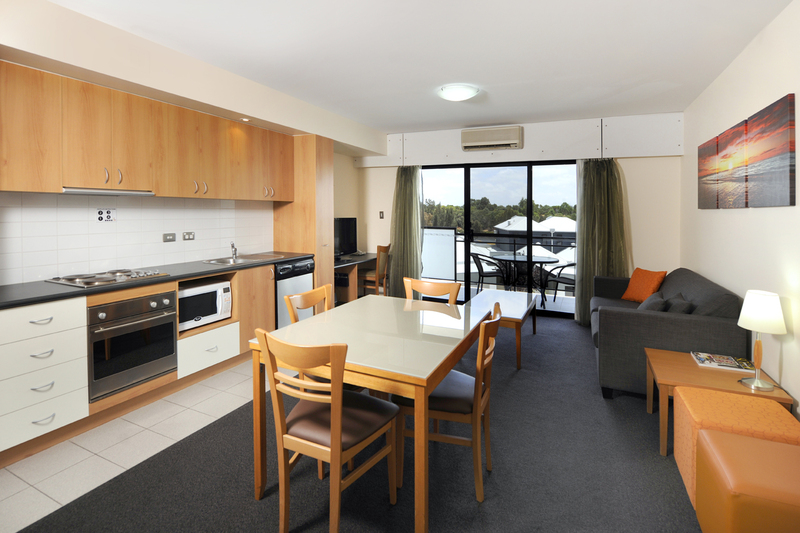 Each apartment has a private balcony with views of the Swan River or Hardey Park and complimentary internet access. All apartments also have access to complimentary onsite parking, the gym and outdoor swimming pool. Fully self-contained Two Bedroom One Bathroom Apartment with fully equipped kitchen and laundry facilities, large dining and living areas. 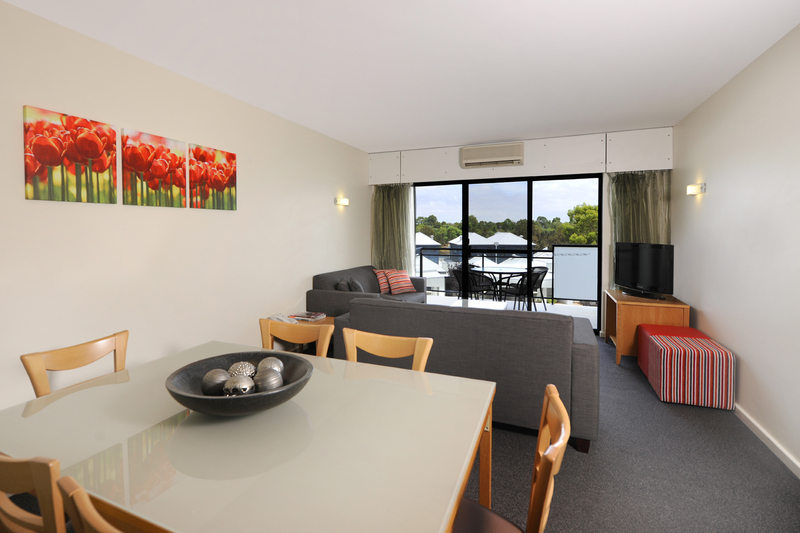 Each apartment has a private balcony with views of the Swan River or Hardey Park and complimentary internet access. All apartments also have access to complimentary onsite parking, the gym and outdoor swimming pool. Some apartments also feature a large Spa Bath (subject to availability on request). Special Access apartments are also available upon request. Two Bedroom Apartments are ideal for corporate travellers, families and groups. Large living areas, balcony and kitchen with two bathrooms, powder room. 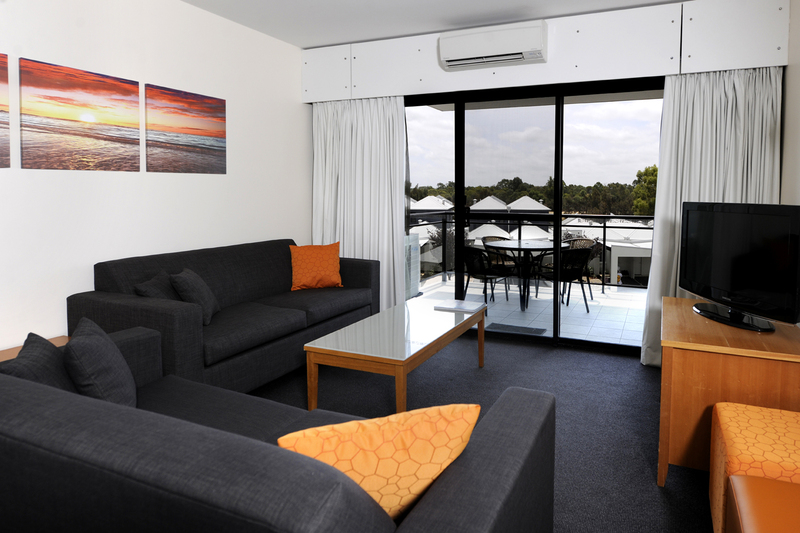 Each apartment has a private balcony with views of the Swan River or Hardey Park and complimentary internet access. All apartments also have access to complimentary onsite parking, the gym and outdoor swimming pool. Some apartments also feature a large Spa Bath. Special Access apartments are also available upon request. Spacious Superior Three Bedroom Apartments with large kitchen, living areas, two bathrooms and balcony overlooking the Swan River. Perfect for groups and families. 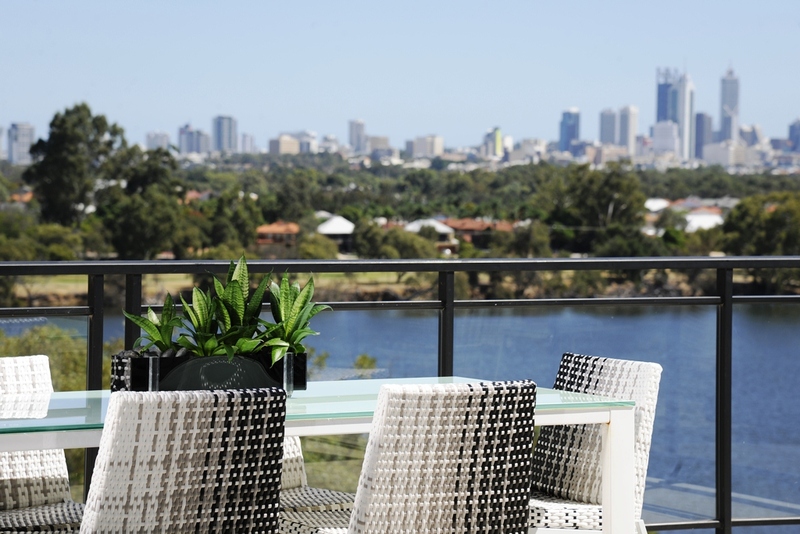 Each apartment has a private balcony with views of the Swan River or Hardey Park and complimentary internet access. All apartments also have access to complimentary onsite parking, the gym and outdoor swimming pool. Exclusive Riverside One Bedroom Villa with spacious living area and kitchen, spa bathroom, private deck overlooking the pool and river and private carport. All apartments have a private carport and complimentary internet access. All apartments also have access to the gym and outdoor swimming pool. Fully self-contained Two Bedroom Two Bathroom two-storey Riverside Townhouse with fully equipped kitchen and laundry facilities. 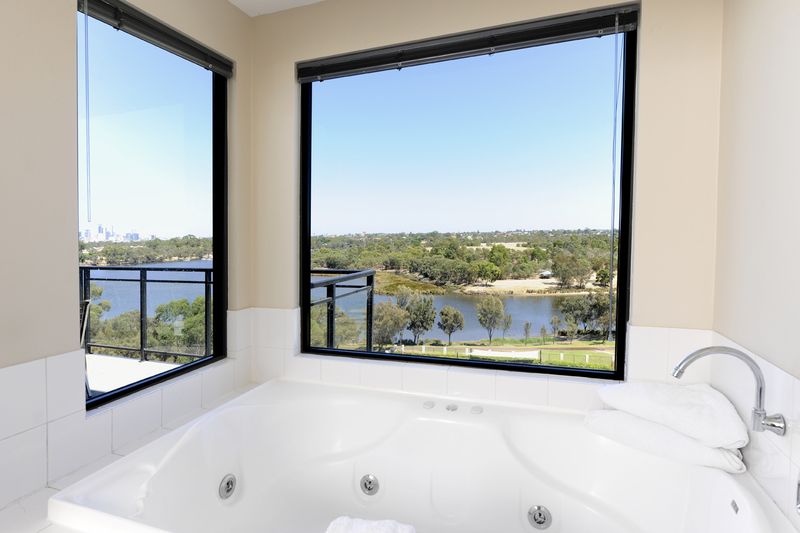 Each apartment features a large Spa Bath and a private deck area overlooking the Swan River and swimming pool. All apartments have a private carport and complimentary internet access. All apartments also have access to the gym and outdoor swimming pool. The perfect mixture of luxury, privacy, space and convenience, our amazing split level riverside suites are perfectly situated between the airport and the CBD for maximum convenience and easy access. The Riverside Two Bedroom serviced apartment comes with fantastic amenities including a private deck overlooking the pool and river, two bathrooms, spa, powder room, large living area and private carport. A minimum of 24 hours prior to the arrival date is required by this property for cancellations. Cancellations made within 24 hours of the check-in date forfeit the full amount for the first night cancelled.